Map of the States of Maine New Hampshire Vermont Massachusetts Connecticut & Rhode Island. A fine example of Tanner's 1825 of New england. 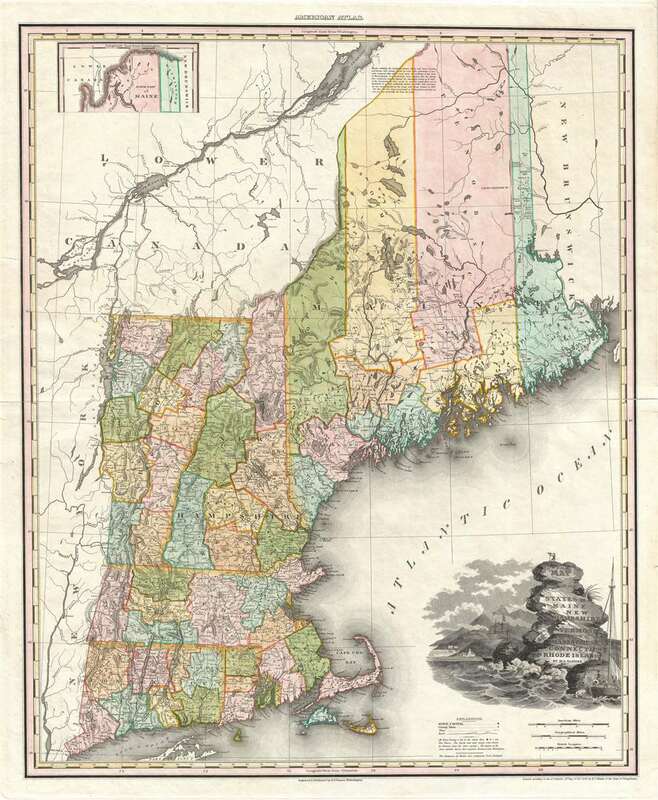 Tanner's map covers the states of Connecticut, Massachusetts, Rhode Island, Maine, Vermont and New Hampshire. It was originally engraved for Tanner's monumental New American Atlas, issued between 1819 and 1823. The present example is from the revised edition of the atlas published in 1825. The New American Atlas is considered to be the apex achievement of what Ristow refers to as the 'Golden Age of American Map Publishing.' each map from the New American Atlas, including the present example, is a finely engraved masterpiece featuring the most up to date cartographic information as well as elaborate thematic cartouche work delicate color work. All maps from this series are highly desirable and have become extremely scarce - the present example being no exception. Very good condition. Original plate mark visible. Original centerfold. Blank on verso. Some verso reinforcement on margins and centerfold. Rumsey 0985.002, 4862.014, 5388.014. Philips (Atlases) 1374-12, 3669-8.